Through proper guidance and exemplary leadership, the Downtown Little League program in NYC assists children in developing the qualities of citizenship, discipline, teamwork and physical well-being. By espousing the virtues of character, courage and loyalty, the Little League Baseball and Softball program is designed to develop superior citizens rather than superior athletes. Character. Courage. Loyalty. Downtown Little League is powered by the passion and commitment of volunteers seeking to provide organized baseball and softball activities for children ranging in ages from 5-18 in Lower Manhattan. What began on a grass lot in Battery Park back in 1992 has evolved into one of the nicest facilities in the City, supporting more than 1000 children every year. 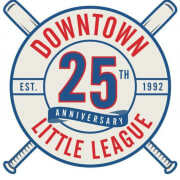 Given its current size, Downtown Little League is among the largest single Little League chapters in the United States. Downtown Little League's fast pitch softball program is one of the premier softball programs in New York City and the State of New York. Following official Little League softball rules and guidelines to ensure fast moving, fun and exciting games, we are proud of developing great girls who can not only compete athletically but are great people and community minded citizens as well. Would you recommend Downtown Little League?